About 500 Lithuanians, some sporting Nazi swastikas, attended a far right march in the country’s second city of Kaunas. The city was the scene of the Baltics worst World War II-era Jewish pogroms, where nearly 10,000 people were killed in one day. 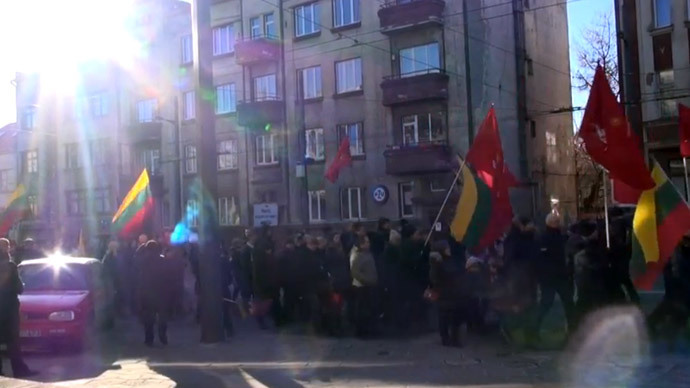 Monday’s march was the eighth such event organized by the Lithuanian Nationalist Youth Union to coincide with one of Lithuania’s two independence days on February 16. According to the Jerusalem Times, the marchers met up in a local park, where around 20 counter protesters from the local Jewish community and anti-fascist groups also turned up to follow them in a silent counter-demonstration. Although overt Nazi-iconography was only used by a select few, other symbols, including the Columns of Gediminas, which leftists charge have become a symbol of the country’s neo-Nazis, were readily on display. Many also carried flags depicting a variation of a triskeilon or triskele, a pagan symbol consisting of three interlocked spirals which has recently been appropriated by neo-Nazis, especially in Germany. The marchers, some of them dressed up in variations of medieval garb, banged drums along the route while others let off green smoke flares. “This march is particularly offensive because it is taking place where locals and Nazis murdered more than 10,000 Jews in one day,” Dovid Katz, a US-born Jewish scholar who moved to the capital Vilnius 16 years ago told the daily. Katz, who edits a website called DefendingHistory.com, was referring to Kaunas massacre of October 29, 1941, where Nazi death squads, collaborating with Lithuanian partisans, killed 2,007 Jewish men, 2,920 women, and 4,273 children in a single day. It was the single worst massacre of Jews in the Baltics during the war. A letter from the Kaunas Mayor’s Office to Katz, which gave the group a license for the event, says overt displays of Nazi symbols, leaders, or uniforms is illegal under Lithuania’s Law on Meetings. The office said that march organizers would face the appropriate criminal or administrative punishments if these or any other laws had been violated during the march. February 16 is the anniversary of the declaration of Lithuanian independence in 1918, when the republic was first created after the First World War. “This comparison [between the Nazi and Communist occupations] is not only false, it also serves to whitewash the stain in these countries’ histories instead of confronting it, as other European nations have done,” Efraim Zuroff, the Israel director of the Simon Wiesenthal Center, told the Jerusalem Times. Approximately 220,000 Jews were living in Lithuania prior to the German invasion in June 1941. It is believed that 206,800 Jews were murdered by the Nazis and Lithuanian collaborators during the occupation.